Page 1 of 1 (webcams from 1 to 6 of 6). Live PTZ webcam of the «Panorama» Spa-Hotel demonstrates the resort village of Kirillovka on the coast of the Azov Sea in the Zaporozhye region of Ukraine. The broadcasts include the swimming pools and hotel area, Peresyp Spit, new recreation centers on the coast and popular attractions for entertainment. Online webcam installed in a conservation area of the Biruchiy island and shows a view of the Sea of Azov and the hotel «Smile of Fortune» in Kirillovka. With this camera, you can see the sea, the beach, travelers and find the current weather in Kirillovka in real time. Dnipro Hotel Webcam: live from Kiev, Ukraine. Dnipro Hotel is an award-winning luxurious hotel located in the center of the ancient city Kyiv. 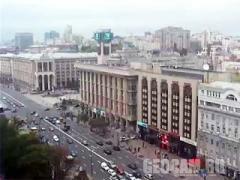 It is situated at the European Square at the beginning of the famous main street, Khreshchatyk. Live webcam is located on the territory of the hotel «Friend Apartments» in the village of Kirillovka, Zaporozhye region. The camera in real time shows a view of the hotel's swimming pool, parking for cars and on the Utylyuk liman of the Fedot Spit. In the evening you can admire the sea sunset on the Uklyuksky liman. Why do you use two different spellings of Kyiv in your description? Ukrainians prefer the spelling 'Kyiv.' The webcam is not working!